The aim of this study was to determine target loads for acidification for representative forest ecosystems in Flanders (Belgium) using dynamic modelling. Target loads were calculated for 83 forest stands for which sufficient measurements were available. This dataset is considered to be representative for the Flemish forest area. It is concluded that, despite the inherent uncertainty in modelling soil acidification at a regional level, important N and S deposition reductions are needed to allow recovery of the Flemish forest soils. Nitrogen saturation in temperate forest ecosystems: hypotheses revisited. BioScience 48: 921-934. Simulation of the long-term soil response to acid deposition in various buffer ranges. Water, Air and Soil Pollution 48: 349-390. Intensive monitoring of forest ecosystems in Europe 2: Atmospheric deposition and its impact on soil solution chemistry. Forest Ecology and Management 174: 97-115. 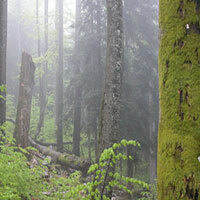 Atmospheric deposition and canopy interactions of nitrogen in forests. Canadian Journal of Forest Research 23: 1603-1616. Impact of decreasing throughfall depositions on soil solution chemistry at coniferous monitoring sites in northern Belgium. Forest Ecology and Management 160: 127-142. SMART: A simulation model for acidification’s regional trends; model description and user manual. Mimeograph Series of the National Board of Waters and the Environment 477, Helsinki, Finland, pp. 43. Bayesian calibration of the VSD soil acidification model using European forest monitoring data. Geoderma 146: 475-488. Dynamic modelling of target loads for forests in Flanders [in Dutch with English summary]. Research project of Flemish Environmental Agency, MIRA. MIRA/2006/03. Report INBO.R.2006.12. Research Institute for Nature and Forest, Brussels, pp. 156. Mapping manual 2004. Manual on methodologies and criteria for modelling and mapping critical loads and levels and air pollution effects, risks and trends. Umweltbundesamt. The condition of forests in Europe. Executive report 2003. United Nations Economic Commission for Europe, Geneva, pp. 42. Soil acidification in loess and clay soil in The Netherlands. Water, Air and Soil Pollution 120: 139-167. A review of the calculation procedure for critical acid loads for terrestrial ecosystems. The Science of the Total Environment 271: 11-25. Simulation of critical loads for nitrogen for terrestrial plant communities in the Netherlands. Ecosystems 9: 32-45.